Every last Wednesday of August, the drab industrial town of Buñol, situated almost 38kms to the west of Valencia, experiences a soup of tomatoes on its narrow streets. A small town which is otherwise populated by mere 9,200 people is exploded by 50,000 people squishing over 150 millions of rotten tomatoes. 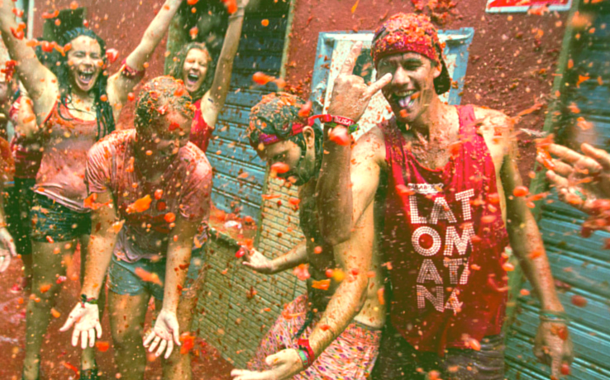 La Tomatina can be conveniently tagged as the Spanish alternative to Holi - tomatoes act as proxy to the colours and bhaang to Sangria. Zindagi Na Milegi Dobara has added to its razzmatazz. Here’s what you should know about the biggest food fight in the world. Hundreds of people from around the world dress up in clothes that they don’t wear again and wait for a signal, the firing of water cannon. No sooner does the whistle blow out, than the over-enthusiastic horde start pelting tomatoes at each other. Large trucks manoeuvre through a crimson planet of people and spew tomatoes on the crowd. The food fight lasts for an hour (officially) and even in that short time, a sea of tomato ketchup brims the alleys of Buñol. A loud ceasefire in form of siren swells the air, indicating termination of the tomato fight. 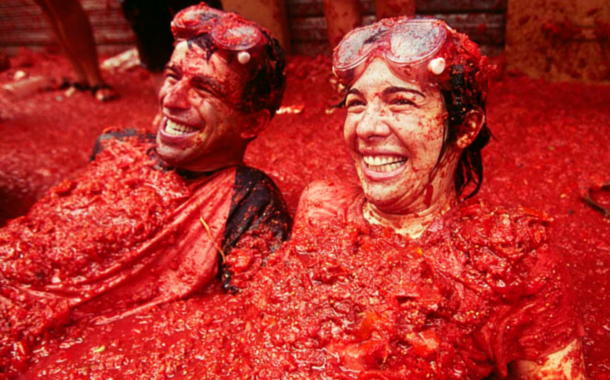 Even though the tomato fight stops, the celebration continues for 3-4 hours. The celebration includes much more than pelting of tomatoes; it’s just another reason to dance and binge on some indecent, yet socially acceptable amounts of Sangria. 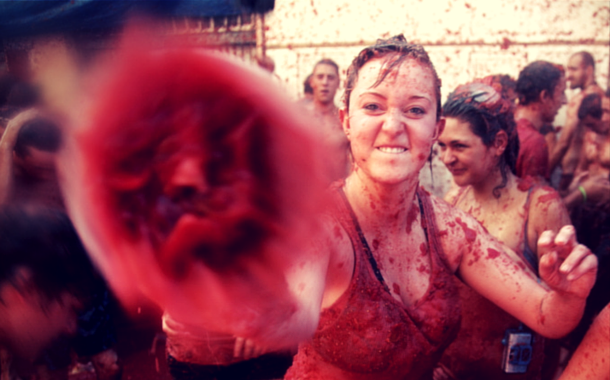 After an eventful shoulder-to-shoulder soupy battle, the four streets of Buñol that constitute the La Tomatina circuit are hosed by government trucks and local residents. On your way back, some God-sent locals may offer water from hosepipes to clean yourself from the grime. This will indeed, save you from the queue at the station shower. ‘Tomayto or Tomahto’, doesn’t matter, but the festival rules do. • Only tomatoes can be used to throw at people. • Don’t carry bottles or hard objects to the event. 1. Wear old clothes that you don’t care of seeing in your closet again. 2. Wash yourself before boarding a train or bus. You won’t be allowed to ‘tomato-sauce’ the entire Spain. 3. Wearing goggles will protect our eyes from the damage caused by the acid in tomatoes. 4. There’s no restriction on photography, but it only makes sense to bring a waterproof or water-protected camera, or not carry any at all. 5. Wear shoes with a good grip (preferably closed) or be prepared for a tomato jacuzzi. 6. Show up early and find a good spot. 7. Heard of the ‘palojabon’? It's a greasy pole with a pork-ham (or prosciutto) perched on its top. The festival commences after someone braves to climb the pole and grabs the prosciutto. 8. Don’t bring anything expensive with you, whatever you carry, keep it secured in a waterproof bag. Many try to reason out against La Tomatina, some say that it is a monstrous waste of food; some say that the acid in tomatoes is not good for health, and some believe it to be insane. Yes, it is insane, but that is what makes it fun! 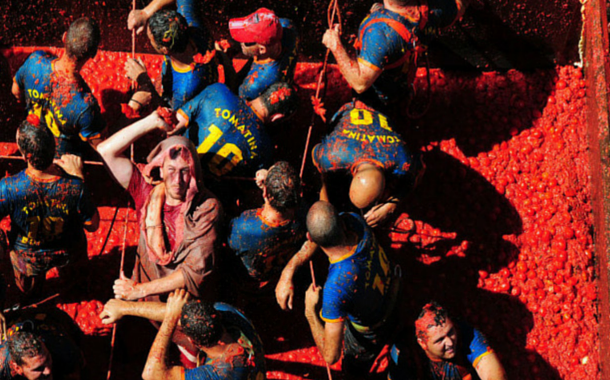 This year, the La Tomatina Festival will be celebrated on August 31, 2016. Explore the fun and adventure of La Tomatina with our package.